Getting high at concerts is still illegal, but should it be? It’s illegal to get high in Colorado concert venues. Should it be? With audience members and comedians consuming marijuana in nearly every way conceivable, the live recording of talk show “Getting Doug With High” on Monday night in Denver felt like the kind of event you’d only see in a post-legalization Colorado. Yet more than three years after Gov. John Hickenlooper signed the historic, cannabis-legalizing Amendment 64 into law, that kind of public consumption remains illegal in the state. But based on the plumes of smoke and vape clouds rising from the audience at north Denver’s historic Oriental Theater, it seemed no one in attendance cared. It wasn’t the first bowl I’ve ripped in the theater, and hopefully it won’t be my last. 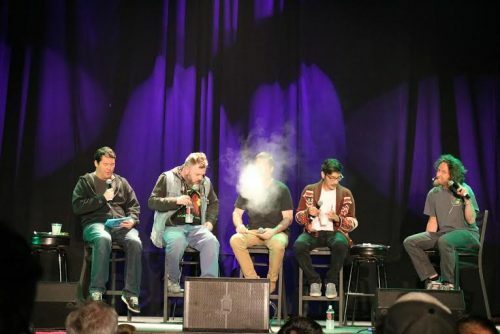 For host Doug Benson, noted pot enthusiast and stand-up comic, the copious amounts of weed didn’t seem to faze him; He told the sold-out crowd of more than 600 people he’d taken hits off of “18 to 19 joints” in the party bus parked in front of the theater. With the crowd I saw in there earlier, it wasn’t surprising to hear. These buses have become a mainstay of ganja-themed events, as they’re a legal place to get high without the venue having to risk being cited for public consumption. The party soon moved indoors, however, as attendees passed pipes and joints with impunity as the panel of comics — Todd Glass, Geoff Tate, Kassem G and Denver’s own Josh Blue — took the stage. While hecklers shouted “Denver!” and “Colorado!” numerous times, the show trucked along, seemingly getting better as I became higher. At one point, I stopped looking around to see if I’d be asked to stop smoking and relaxed. Security at the theater had intervened when audience members lit up during a 4/20 show featuring The Lucas Brothers, a comedy duo who became too high to perform; The staffers were warning attendees that undercover police officers might have been present. The same was true of a screening of “The Interview” at the Oriental, where actor Seth Rogen promised to smoke with the crowd — before opting instead for a bottle of tequila. So why wouldn’t law enforcement be at a show billed as comedians getting high on stage and streamed on the internet? The notion of performers lighting up on stage isn’t new, from Snoop Dogg to Miley Cyrus, and crowds in Colorado fire up joints regularly. The line between permitting use and looking the other way seems vague at best, and this selective enforcement has real consequences. 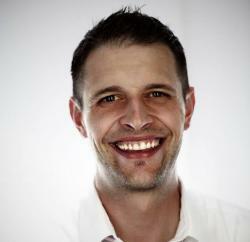 Venue owners are warned that permitting use on site could result in heavy fines or worse. “I think most people understand our liquor license, and therefore our ability to operate, is on the line,” says Scott Happel, general manager of the Oriental Theater. All of this may seem arcane for a state that sold nearly $1 billion of marijuana in 2015. A proposed measure to allow for limited legal consumption was withdrawn in September of last year amid assurances from city officials and business leaders that they’d work toward a solution, yet no progress has been seen publicly. A separate campaign by NORML, the National Organization of the Reform of Marijuana Laws, is still collecting signatures for The Responsible Use Denver Initiative that would allow for special event permits covering marijuana use at venues. With the election just several months away, though, the effort faces serious hurdles. Voters approved adults consuming cannabis responsibly. It’s time we recognize that marijuana and concert venues have coexisted for years, and being able to host a show in which five comedians get high endangers no one. In fact, it’s pretty fun.